The following is the Presidential Address delivered at the 107th Ard Fheis of Republican Sinn Féin last month in which Des Dalton reviews events of the past year and looks to the future. A Chathaoirligh, a Theachtaí is a cháirde go léir. Once again I am honoured to most heartily welcome you all to the 107th Ard-Fheis of Sinn Féin. We gather in national conference to take stock of where we are, to plan for the coming year and most importantly to ensure that we are capable of meeting the challenges that face us in the coming years. Over the past year Republican Sinn Féin has been targeted by the British State in an obvious attempt to silence us. Your presence here this weekend tells us they have not been successful – and nor will they be. Today the Irish people are being squeezed between the old imperialism of British occupation and the new imperialism of the EU/ECB/IMF. The need for a truly revolutionary Republican Movement has never been greater. This year marked the 30th anniversary of the heroic sacrifice of Bobby Sands and his nine comrades who died on hunger strike in the H-Blocks of Long Kesh in 1981. As we remember the blanket men and women of 1981 we restate our support for the Republican prisoners in Maghaberry prison today who are upholding the same principles in the face of the same enemy. Since the beginning of the year it has been self-evident that the British and 26-County states have made it a matter of policy to target Republican Sinn Fein. On January 23 Republican Sinn Féin held a very successful march in Lurgan, Co Armagh to protest at the internment without trial of Veteran Republican Martin Corey – who has been held in Maghaberry Prison since April 30, 2010. On February 16 the RUC/PSNI issued a letter to the President of Republican Sinn Féin accusing him of participating in an “illegal march” in Lurgan on January 23. The same letter was also sent to other members. A number of Republicans were arrested soon after this in the Armagh and Lurgan areas. This marked the beginning of what has been a concerted attempt to silence Republican Sinn Féin or indeed anyone who refuses to accept British rule in any part of Ireland. In May Republican Sinn Féin Ard Chomhairle member Cáit Trainor (Armagh), along with a member of the Thomas Harte Cumann in Lurgan Seán Moloney, were arrested and charged with political views expressed in an interview given to Channel Four News in September 2010. If this case goes ahead it will be one of great consequence not just for Irish Republicans but for all political activists because the charges represent an attack on the fundamental right to hold and express a political opinion as set out in the UN’s Universal Declaration of Human Rights. In this regard it would have serious repercussions for all who are intent on securing real political and economic change. We are calling on all human rights and civil liberty organisations to speak out about this attack on freedom of speech and the ability of the media to fairly and accurately report what is happening in the Six Counties. During the protests in Dublin against the visit by the Queen of England in May the Secretary of Dublin Comhairle Ceantair Diarmuid Ó Dúbhghlais and another member of Republican Sinn Féin were arrested solely because of their participation in the protests. Diarmuid Ó Dúbhghlais was pictured by the media holding aloft the National Flag at the time of his arrest. Later members of the 26-County Police were shown dumping a Tricolour in a Dublin City Council bin-lorry. On June 30 the home of our newly-appointed National Publicity Officer Geraldine McNamara in Tipperary town was raided by the 26-County Special Branch and her mobile phone was taken. Again this was act intended to silence and intimidate Republican Sinn Féin members and supporters. The pattern of harassment continued with the arrest of the organisation’s President and Vice-President on July 6. The opposition of the RUC/PSNI and the Six-County Public Prosecution Services (PPS) to bail for both men was clearly an attempt to intern Des Dalton and Fergal Moore by remand. On July 8 Cáit Trainor was once again arrested at her home in Armagh and charged with breaking her bail conditions by attending the picket on Lurgan RUC station on the night of Des Dalton’s arrest. She was taken straight to Craigavon courthouse. After a court appearance on September 7 Fergal Moore was again arrested as he left the courthouse in Craigavon in the company of his solicitor. He was once more taken to Lurgan RUC/PSNI barracks and this time charged with participating in the 1916 commemoration in Lurgan at Easter this year. To date 37 people have been charged in relation to the Martin Corey march in Lurgan – some also face charges in relation to the 1916 commemorations in Lurgan and Armagh. At a time when people in the Middle East are being applauded for coming out on to the streets to protest, in the Six Counties people are being prosecuted for doing just that. Westminster, Stormont and Leinster House fear the revolutionary Irish Republicanism espoused by Republican Sinn Féin. It is a cause with deep roots in Irish history and the hearts of the Irish people. The age-old tactic of locking up the messenger as a means of silencing the message has failed in the past and history teaches us it will continue to fail. One is reminded of the words of Pádraig Mac Piarais at the grave of O’Donovan Rossa: “The defenders of this realm have worked well in secret and in the open. They think that they have pacified Ireland. They think that they have purchased half of us, and intimidated the other half.” Republican Sinn Féin represents that section of the Irish people who have neither been purchased nor intimidated, and never will be. This year marked the 30th anniversary of the 1981 Hunger Strikes. Beginning in March Republican Sinn Féin marked the anniversary with a series of commemorations and commemorative events throughout the country. Events were also held in the United States and Rome. In Ireland this culminated in a very successful commemoration at Bundoran in August and finally to mark the anniversary of the ending of the hunger strike a candle-light vigil was held at the GPO in Dublin on October 5 and finally on October 8 a seminar was held in Wynn’s Hotel in Dublin. It was an emotional afternoon of songs and poems of the hunger strike and the highlight of the afternoon was an address by former H-Block Republican prisoner Richard O’Rawe. I would like to take this opportunity to applaud Richard O’Rawe for the great moral and physical courage he has shown in publishing his two books on the 1981 hunger strike. To publish those books required the same moral and physical courage he showed as a blanketman and political prisoner. By his action he has ensured that an important and honest account of the hunger strikes has been placed on the historical record to be read by this and future generations. Maith thú, a Risteárd! Thirty years later another group of young Irish Republican prisoners are engaged in a prison protest on the same principle in defiance of the same enemy. This protest is a result of the rights won by Bobby Sands and his comrades being signed away under the terms of the 1998 Stormont Agreement. On March 5 the Republican POWs in Maghaberry announced that because of the failure of the Stormont regime to implement the August 2010 Agreement they were forced to return to protest. They have endured 23 and 24-hour lock-up, degrading forced strip-searches, denial of both family and legal visits. In their statement of March 23 they declared: “Thirty years ago this year our comrades in the H-Blocks of Long Kesh resisted such criminalisation which resulted in the deaths of ten young brave men. Many others suffered unspeakable horror in their fight for political status. We ask the public, our comrades and supporters to remember them and ensure that this will not happen again.” On August 8 and 9 the Republican POWs went on a 48-hour fast to highlight their protest. On the outside Republicans have engaged in an active campaign of protests, pickets, and vigils throughout Ireland. Internationally our International Relations Bureau in cooperation with friends and supporters throughout Europe organised an ‘International Day of Action’ on October 8. On that day protests were held in Paris (France), Rome (Italy), Darmstadt, Magdeburg, Hamburg (all Germany), and further protests in other cities and various countries such as Austria and the Netherlands. They are to be congratulated on raising awareness of the Maghaberry protest internationally. An example of true internationalism at work. Well such a method is already available in the form of the electronic BOSS chair, already in place and which the prison regime has refused to make use of. 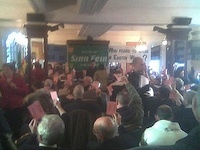 Republican Sinn Féin repeats its call for the immediate implementation of the independently-mediated August 2010 Agreement. We extend our greetings and solidarity to the Republican prisoners in Maghaberry and pledge them our continued and active support. We also extend our greetings to the Republican POWs in Portlaoise for their loyal commitment to the cause of the All-Ireland Republic. This year saw the long-threatened and unwelcome visit by the Queen of England to the 26-County State take place between May 17 and 20. A ring of steel – including members of the British intelligence services — was thrown up, resulting in Dublin being effectively closed down for two days. The estimated cost of the visit varied from €30 to €40 million. The extravagance of the visit with its itinerary of a lavish State dinner and tours of stud-farms contrasts with the savage cuts being applied to the pay and welfare of the most vulnerable in our society. Irish Republicans ensured that the carnival of reaction which surrounded the recent visit was challenged both on the streets and in the media. In Dublin, Kildare and Cork members and supporters of Republican Sinn Féin held successful protests. In the media the undiluted message of revolutionary Irish Republicanism was given to media all over the world. From Al Jazeera to Iran’s Press TV, to Sky News, CBS and NBC and Fox News in the US, Canadian TV, media from Brazil and Spain, all reported on the fact that this visit was being met with protest and importantly why the protests were happening. I wish to salute the decision of eight of the nine counties of Ulster not to attend the visit of the Queen of England to Croke Park on May 18. By their actions they have salvaged the honour of the GAA and have spoken for GAA members throughout Ireland who opposed this hijacking of our Association in order to normalise British rule in Ireland. The GAA and Páirc an Chrócaigh where the All-Ireland Football and Hurling Finals are staged each year embody the essential unity of the Irish Nation. Bringing the head of the British State whose occupation of six of the nine counties of Ulster is a denial of that essential right to unity and right to national freedom. It is a contradiction of the principles upon which the GAA was founded. The announcement on Friday last that the RUC/PSNI is to play in Croke Park on November 25 shows that the GAA is once again being used to normalise British Rule in Ireland. Bringing the British Colonial Police into Croke Park - like the visit by the Queen of England - contravenes the essential principals upon which the GAA was founded, namely the essential unity of Ireland as a nation. This principle is reflected in the fact that the GAA has never recognised the British imposed border but has remained an All-Ireland association. Faithful Irish Republicans many of whom are members of the GAA will oppose this visit and will use it to highlight the fact that British Rule in Ireland is not or never will be normal or acceptable. Like James Connolly we say “England has nor right in Ireland, never had any right in Ireland and never can have any right in Ireland”. On May 29 Republican Sinn Féin held a rededication ceremony at the Garden of Remembrance in Parnell Square, Dublin. The Garden was hijacked for the visit of the Queen of England and so the purpose of the ceremony was to rededicate the Garden to its original purpose ie, honouring all of the men and women who have died in pursuit of Irish Freedom since 1798. On April 20 I had the honour of being the first President of Sinn Féin to visit the United States since Ruairí Ó Brádaigh in 1973. Over the course of the 14-day visit much hard work was put in by Cumann na Saoirse to ensure the visit was a great success. It included the Easter 1916 Commemoration and the Annual Michael and Pearl Flannery Dinner. Meetings were also held with various representatives of Irish American and general public opinion with the purpose of raising awareness of the ongoing protest by the Republican prisoners in Maghaberry as well as promoting our alternative for a New Federal Ireland, ÉIRE NUA. Evidence that the visit had impacteded on the political establishments on both sides of the Atlantic quickly emerged when the leadership of the American Ancient Order of Hibernians made a clumsy attempt to stop their members meeting with Republican Sinn Féin. I am delighted to report it is an instruction that has been ignored. Throughout the visit one consistent message was delivered and that was the undiluted gospel of revolutionary Irish Republicanism. While schools are being closed by the Provo Stormont Education Minister and a 19% cut has been made in social care spending, one area where spending has not been cut is the enforcement of British rule in the Six Counties. All the while the usual round of house raids and random arrests continue. Plenty of money for arrests, courts and jails but not for schools or social services. There is it seems a limitless budget when it comes to repression. There were three examples this year which show the attitude of the British government to its activities in Ireland has not changed. Firstly, the report of the Rosemary Nelson Inquiry, published on May 24, found that the British State failed to protect Rosemary Nelson before her murder by loyalists in 1999 but did not collude in her killing, despite clear evidence of collusion. Secondly, the discredited British Police Ombudsman Al Hutchinson launched a report on June 24, which ignored the blindingly obvious evidence of British State collusion in the murder of six innocent and uninvolved nationalists at the hands of a loyalist death squad in Loughinisland in 1994. On September 5 the Six-County Criminal Justice Inspection report into the office of Police Ombudsman described Hutchinson’s management as “dysfunctional”. It also found that criticism of the conduct of the RUC contained in reports into some of the most controversial killings during the war in the Six Counties were removed without any explanation. The loyalist attack on the nationalist community on the Short Strand during the July Orange parades and particularly the response of the RUC/PSNI to it are a clear illustration that the relationship of the Six-County State to the nationalist people has not changed. Following two days of carefully “orchestrated” – the description of the British colonial police themselves – violence by the UVF, the response of the Stormont junta and their police force was to arrest two nationalists and open up talks with the UVF. On the other hand loyalist-orchestrated violence met with little or no response from the RUC/PSNI – indeed in Ballyclare, Co Antrim the Assistant Chief Constable apologised to loyalists for removing flags, an action that led to serious rioting. Compare this to nationalist areas where the RUC/PSNI had no hesitation in using plastic bullets and water cannon. There were widespread arrests and in a dangerous development the media were forced to hand over film footage to be used in prosecutions. One can only judge a State or a society by how it treats its most vulnerable. In the 26 Counties we have witnessed the litany of reports of ill-treatment of the both the young and the old. In the Six Counties the case of Brendan Lillis is just another example of how, for all its boasting about its championing of the rule of law and human rights, when it comes to dealing with the Irish people Britain just can’t break the habits of the coloniser when dealing with the colonised. The Provisional spin-doctors have written countless words about the “new dispensation” and a “new police force”. What we have is the same old British wolf dressed up in the lamb’s clothing afforded it by the 1998 Stormont Agreement. The Review of the Northern Ireland Prison Service report finds that in all prisons in the Six Counties there is a disproportionate number of Catholics in the prison population – 55 per cent as compared to 44 per cent of the general population of the Six Counties. The report found there were “apparent and consistent disproportionalities in treatment and outcome in all the male prisons, in areas that depend principally on staff discretion”. In other words where the prison staff have the opportunity they discriminate on sectarian lines against prisoners who are Catholic. The report states that Catholics were over-represented in areas such as prison discipline – adjudication, use of force and segregation. Catholics were under-represented in terms of temporary release (for healthcare, emergencies or resettlement). In Maghaberry prisoners who were Catholic were over-represented in the poorer accommodation on the “square houses” and “Protestants over-represented in the newer and better units”. The bottom-line here is that the Six-County State is fundamentally sectarian and undemocratic. All of its institutions reflect this including its police force and its prisons. This is all far removed from the teachings of Tone, Davis, Connolly and Pearse as you could get. As Republican Sinn Féin have continuously pointed out there is an alternative to all of this. ÉIRE NUA is the key to fashioning a New Ireland. ÉIRE NUA is inclusive of all sections of the Irish people. Because it is only the Irish people themselves who can create an Ireland capable of living up to the principles of the 1916 Proclamation. An All-Ireland Constituent Assembly would provide the forum for all sections of the Irish people to discuss and decide the shape of a New Ireland; to such an assembly we would bring ÉIRE NUA. Such an open and democratic process is in stark contrast to the shadowy world of the current process where secret deals have been hammered out behind the closed doors of Whitehall and Stormont and behind the backs of the Irish people. ÉIRE NUA replaces the mystery, the intrigue, the sharp practice and the sleight of hand and replaces it with the sovereignty and the democratic will of the Irish people. In the 26 Counties the people are being confronted by the new imperialism of the EU/ECB/IMF. The Troika have already demanded that the 26-County Administration sell off €5 billion of assets. In other words essential infrastructure such as energy supply, public transport, parks and woodland etc would be sold to the highest bidder. The 26-County Administration merely carries out the directives of their political and economic masters in Brussels, Frankfurt and Washington. Before the last 26-County election Republican Sinn Féin pointed out that the election was meaningless as it entailed merely replacing one set of gombeen politicians with another. Within less than a month of the formation of the new 26-County Administration it was clear for all who were willing to see that the real political and economic masters were in Brussels and Frankfurt. Fine Gael and Labour fell over themselves to sign up to the austerity programme agreed by their predecessors. It seems it was Frankfurt’s way after all! Already the effects of the cuts in public spending are being felt by the parents of special needs children with the cuts in Special Needs Assistants (SNAs) effectively depriving thousands of children of their right to an education. The Irish people are to be sacrificed so that the undemocratic and unaccountable EU superstate can be kept afloat, confirming Republican Sinn Féin’s consistent analysis of the threat the EU posed not only to Ireland but also to the political and economic sovereignty of all small nations. The most vulnerable and marginalised in society are in the sights of this political and economic elite not just in Ireland but also across Europe. The old, the young, the unemployed and those with special needs are to be the fodder used to bolster up a failed currency and the failed political project that is the EU. It was against this backdrop that on November 2, €715 million was handed over to the anonymous unsecured bondholders of the defunct Anglo-Irish Bank. The crucial difference, of course, is that Norway has retained its political and economic sovereignty and crucially Norwegian oil and gas are largely State-owned, giving Norway a £400 billion wealth fund. What would ownership of our resources mean? According to estimates Ireland’s Atlantic Margin contains 10 billion barrels of oil. At present markets prices that amounts to between €800 and €1,000 billion, more than ten times the size of the EU-IMF bailout. The SIPTU Oil and Gas Review Group in its report said that the licensing terms should be reviewed in the light of increasing energy prices, new technologies for extracting finds, and our current economic problems. Republican Sinn Féin would go further and say that Ireland’s resources belong to Ireland and should be utilised for the benefit and welfare of the Irish people. In the coming year we hope to publish a policy document on the ownership and use of our natural resources. I would also like to once more salute Maura Harrington and the rest of the Shell-to-Sea campaign on their tireless defence of the Irish people’s right to the ownership of Ireland’s natural resources. People need to get out and get radical just as the people of Greece have shown. By their militancy they have forced their government to hold a referendum on the terms of the EU-IMF bailout while also burning the bondholders to the tune of 50 per cent. At a minimum the people should be entitled to the same right to a vote on an austerity programme which will impoverish not only this but future generations. However in supporting the calls for a referendum in the 26 Counties we should be mindful of the contempt the political establishment in Dublin and Brussels have shown to the democratically-expressed will of the people of the 26 Counties in both the Nice and Lisbon referenda. A referendum in itself is not enough. In SAOL NUA we set out a vision of a new sustainable economics in which growth is measured against the welfare of people and the development of society in terms of health, education, employment, distribution of wealth, etc. These are the real measures of the health of an economy. Tinkering around the edges of a failed political and economic system is not the answer. People need to seize the moment themselves and in doing so reject a political and chattering class who will never let go of this failed system because it will never be in their own self-interest to do so. Bliain tar éis don Straitéis Fiche Bliain don Ghaeilge a bheith fógraithe ag Rialtas Bhaile Átha Cliath is cúis imní an ciúnas iomlán ó shin faoi. Idir an dá linn leanann an ghéarchéim teanga sna Gaeltachtaí, stoptar Gaelscoileanna nua á mbunú agus tá útamáil Adams agus a chairde i bhForas na Gaeilge ag tachtadh na n-eagras deonacha. One year on from publication, nothing but silence surrounds the Dublin government’s 20-year Strategy for the Irish Language, which continues to promote vague discredited one-way bilingualism — the Irish speaker yielding all the time but the English speaker never yielding to the Irish speaker. The original national aim of the restoration of Irish as the primary language of the nation is the only one which will deliver fair, balanced and healthy bilingualism. We view with alarm the move away from allowing parents and communities to set up Gaelscoileanna, and indeed other Patronage schools, to the present situation where the State decides the areas where the schools are established and by whom. Up to 10 parents’ groups have given up in their efforts to start Gaelscoileanna in the last three years due to this alarming anti-Irish language policy by the 26-County Department of Education. The present stand-off between Foras na Gaeilge and the language organisations is also to be regarded with great worry. Foras na Gaeilge wants to take away the basic funding of organisations such as Conradh na Gaeilge and Gael Linn, among others, in a way that threatens the core ethos of these groups. Foras na Gaeilge is dominated, since its instigation by the Stormont Agreement, by Adams’s and McGuinness’s people. Where now is their famous commitment to the language and our proud historical language organisations are under severe stress and strain, with their very existence under threat by these proposals? As Irish Republicans we view Ireland’s long struggle for national freedom as part of the international struggle against imperialism. In keeping with this position Republican Sinn Féin’s foreign policy – first put forward in 1976 – calls for action in three concentric circles: (a) with the other Celtic countries toward a Celtic League on the lines of the Nordic Council or the Arab League; (b) with the stateless nationalities of Europe and the working-class movements in Europe toward “a free federation of free peoples” (which was James Connolly’s goal); and (c) with the formerly-colonised nations and the people still struggling against colonialism such as Palestine. The resource wars of the 21st century continue unabated as we can see with the latest imperialist intervention in Libya by Britain, the United States, France and Italy. Once more we are witnessing a scramble for Africa and the control of resources such as oil and water supplies, while the triumphalist parading of the dead body of the Libyan leader Muammar Gaddafi shows that when speaking about the sanctity of human life the western political establishment and their mouthpieces in the media apply a double standard. Over the coming years we will with pride commemorate the significant dates in our revolutionary history including the centenaries of the founding of the Irish Volunteers, the Irish Citizen Army and Cumann na mBan as well as the 1913 Lockout. As the legitimate heirs to the legacy and mantle of 1916, as the political representatives of those who have never abandoned the All-Ireland Republic proclaimed at the GPO, Republican Sinn Féin will mark the centenary of the Rising with pride and also conscious of the unfinished work which remains to be done. We face into the coming year mindful of the threats and challenges, which lie ahead. But we do so armed with the confidence and belief that our proud tradition gives us. Let us go forward firm in our beliefs and convictions at the forefront of the struggle for Ireland’s political and economic freedom. Go raibh mile maith agaibh ar fad. Beannacht dílis Dé oraibh go léir. Long live the All-Ireland Republic.